Important Notice – Please make sure that you agree fully to our Terms & Conditions before reading the safety advice below. 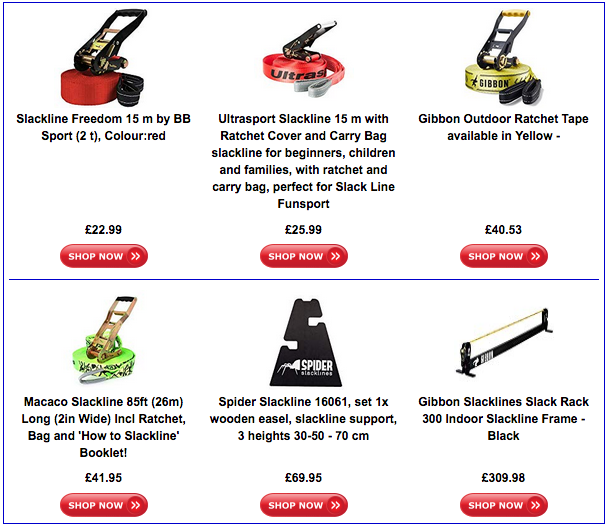 As with most sports injuries can and do occur with when using Slackline equipment. But by taking just a few precautions during setup and usage, these situations can really be minimised. Always read the manufacturers instructions fully before setting up your line. When first setting up your line it is very important to ensure that the anchor points are stable. The forces that go through a line when under tension are huge. If an anchor point fails the line becomes a giant catapult usually with a heavy metal ratchet at one or even both ends. Trees in parks and gardens generally make good, solid anchor points, although please use tree protectors. An A Frame can be used along with the anchoring point, but ensure that it is specifically designed to withstand the forces produced while slacking. 2. Don’t over-tension the webbing and always lock the ratchet(s). Realistically it is difficult to over-tension the line webbing using the standard ratchet kit that will come with it. However we have seen instances of people using a pulley system to pull a ratchet tighter than usual. This could lead to equipment failure and is not advisable. Once the line has been tensioned, always put the ratchet into the locked position. It is also a essential to take the loose tail end of the line and fasten it securely to the anchor point. A lot of Slackers love to slack on the beach wearing just a pair of shorts and a t-shirt. This is airy and comfortable on a sunny day of course but it can lead to injury. The edges of the webbing are sharp and can cut into bare feet and having the line whip up and hit a part of your body while performing tricks or when falling off can cause cuts and bruises (slack-tats) on bare skin. It is advisable to wear long trousers, shoes and at least a long sleeve t-shirt when on the line particularly during tricklining. If you are practicing Highline activities then always use a safety harness and a backup line or rope. As with any sport, risk of injuries to joints and muscles can be reduced be warming-up first. So, make sure you perform a warm-up as you would with any other sport or gym session before starting. Copyright © 2019 Slackline.co.uk. All rights reserved.